Letha was born in Honolulu, Hawaii and raised in Greeley, Colorado. She currently lives and works in Brooklyn, New York. To download her current resume as a PDF click here. The Newest Romantics: Sculptors of Botanic Photography, New Art Center, Newtonville, MA. Woven, Curated by Xaviera Simmons, 60 Wall Gallery at the Deutsche Bank's Americas headquarters, New York City, NY. What is a Photograph?, International Center of Photography, New York, NY. Jason Middlebrook and Letha Wilson , Retrospective Gallery, Hudson, NY. Ain'tings , Robert Blumenthal Gallery, New York, NY. Curated by Ryan Steadman. Shakti, Brand New Gallery, Milan, Italy. Implicit Horizon, Mixed Greens, New York, NY. The First 15: The Meredith S. Moody Residency at Yaddo, The Tang Museum, Saratoga Springs, NY. Haptic Translations, OHWOW, Los Angeles, CA. Organized by Christine Messineo. Monuments and Landmarks (solo exhibition), Art in General, New York, NY. Harlem Postcards, Studio Museum of Harlem, New York, NY. Clear Cut, G44 Centre for Contemporary Photography, Toronto, Canada. Catalogue. Grounded at Airplane, Brooklyn, NY. Curated by Rico Gatson. What I Know, NYCAMS, NYC. Curated by Jason Andrew. BAM Next Wave Art at Brooklyn Academy of Music, Brooklyn, NY. Curated by Dan Cameron. Opening Reception: Tuesday Sept. 13th, 6-8. Artists Talk: Sat. Sept. 17th at 5pm. Composite Materialism: Ethan Greenbaum, Letha Wilson, Tamara Zahaykevitch. SPACE Gallery, Portland, Maine. ROY G BIV at Waterhouse and Dodd. Curated by Trong G. Nguyen. Project Space, Stene Projects, Stockholm, Sweden. J.J. Holdings and Friends, a J.J. Holdings Affair, 94 Prince Street, 2nd Floor, NYC. Work Hard at Wildlife, organized by Jon Lutz / Daily Operation. A one night show of limited edition artworks, more info here. So Different, So Appealing at Gramercy Park Hotel, Penthouse. NYC. Organized by Rachel Churner and Ryan Steadman. Imprecise Geometry: Niall McClelland, Jong Oh, Letha Wilson, organized by Wendy Olsoff (P.P.O.W.) at 308at156 project space, 156 5th Avenue, NYC. The Death of Affect at Art Blog Art Blog, 508 W. 26th Street, 11th Fl, NYC. Cut/Paste at Big&Small/Casual Gallery, Long Island City. This is The Same as That: Dave Murray and Letha Wilson at LVL3, Chicago, IL. Late Summer Blues at Storefront, Brooklyn, NY. Curated by Sara Reisman and Ian Daniel. Goodbye Space Shuttle at Curbs and Stoops, Brooklyn, NY. Mountain Standard Time & Place at Modbo, Colorado Springs, CO. Collective Show New York 2010 at PARTICIPANT, Inc. Waste Not, Want Not at Socrates Sculpture Park, Long Island City, NY. Troy, NY. Curated by Jennifer Moon. New York, NY. Curated by Patricia Maloney. Peekskill, NY. Selection curated by Tania Duvergne. New York, NY. Curated by Dan Tague. Brooklyn, NY. Organized by Matthew Lusk. Brooklyn, New York. Curated by Tomoko Ashikawa. New York, NY. Curated by Trong Nguyen. New York, NY. Curated by Tomoko Ashikawa. 1998 Augusta Hazard Painting Award, Syracuse University Painting Dept. Bergeron, Chris. "New outdoor sculptures coming to deCordova", The MetroWest Daily News, August 2017. Galvin, Haley. "Digital Mediums Change Art", Northern Star, Sept. 14, 2017. "Surface Moves", Wall Street International, November 4rth, 2016. Keller, Yelena. "Kate Steciw and Letha Wilson Paris", Tropical Cream, October 27, 2016. McKenzie, Abby, "Concrete Contradiction", Keen On Magazine, October, 2016. Yalka, Mael. "25 Captivating Photographers Whose Work You Need In Your Life", Fader, September 29, 2016. Micchelli, Thomas. "Art, Work, and the Workaday", Hyperallergic, July 30, 2016. Landes, Jennifer. "Reflection and Facsimile at Eric Firestone Gallery in East Hampton", The East Hampton Star, July 21, 2016. Capossela, Francesca. "18 Artists Reimagine the Great Cross-Country Road Trip", The Creators Project, June 26, 2016. Gerrity, Jeanne. "Letha Wilson and Richard T. Walker's 'The Distance'", Art Agenda, December 1, 2015. Hung, Mailee. "The Distance at Capital Gallery", Art Practical, November 29, 2015. Perlson, Hili. "Take a Sneak Peek at Highlights From Paris Photo Opening This Week", Artnet News. November 9, 2015. Bambic Kostov, Anika. "Brand New Expression in Painting at Brand New Gallery Booth at Artissima", Widewalls. November 2015. Laster, Paul. "Reviews: Letha Wilson", Modern Painters, October 2015. Pg. 84. Schriber, Abbe. "Critic's Picks: Los Angeles", Artforum, October 2015. Gottschalk, Molly. "From Erwin Olaf to Letha Wilson, 15 Trailblazing Photographers at "Amsterdam's Unseen Photo", Artsy.net, September 15, 2015. Noice, E.D. "Intersecting Intent: Catfish at Anat Ebgi Reviewed", Aqnb Magazine. Bambic Kostov, Anika. "Brand New Expression in Painting at Brand New Gallery Booth at Artissima", Widewalls. Gottschalk, Molly. "From Erwin Olaf to Letha Wilson, 15 Trailblazing Photographers at Amsterdam's Unseen Photo", Artsy.net, September 15, 2015. Schwendener, Martha. "Review: 'Weird Science', A Group Show of Experimental Art", New York Times, July 30, 2015. Pg. C22. Nicholas, Vanessa. "Concrete Canyons" , Magenta Magazine, Spring 2015, Vol. 6, Num. 1. Aletti, Vince. 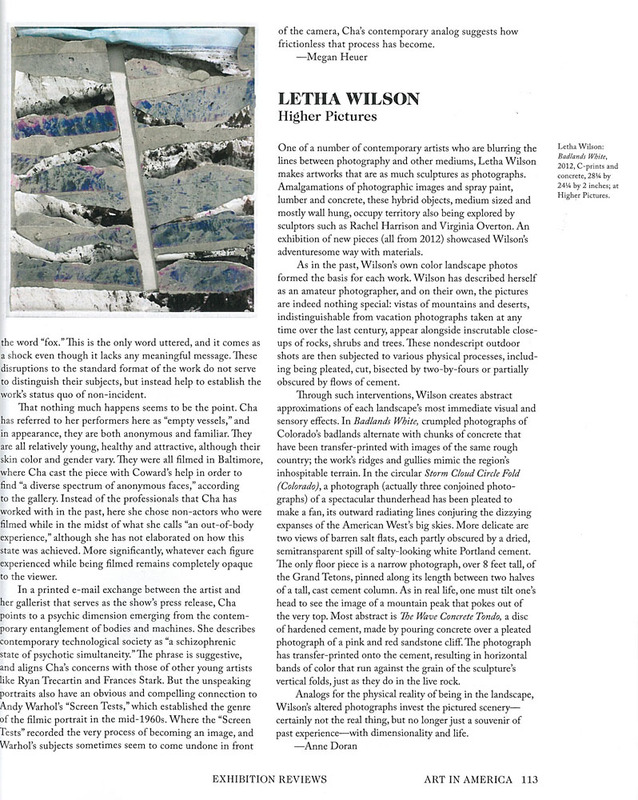 Goings On About Town: Art "Letha Wilson," The New Yorker, December 15, 2014. Knoblauch, Loring. "Letha Wilson @ Higher Pictures", Collector Daily, December 15, 2014. Johnson, Paddy, "This Week's Must See Art Events", Artfcity, November 17, 2014. Taylor, Phil. "Letha Wilson Galerie Christophe Gaillard", Artforum, October 9, 2014. Indrisek, Scott "Hauser & Wirth Has Your Multi-Generational Photography Weekend", BlouinArtInfo, June 27, 2014. Sanchez, Gabriel H. "What is a Photograph at ICP" Critic's Picks, Artforum.com, March 2014. Steinhauer, Jillian. "'Space Heater' at Harbor Gallery" Hyperallergic.com, March 3, 2014. Bohnacker, Siobhan. "What is a Photograph?" Photo Booth, The New Yorker.com, January 2014. Johnson, Ken. "Digital, Analog and Waterlogged",The New York Times, January 30, 2014. Page C27. "What is a Photograph" color exhibition catalog, International Center for Photography, New York, NY. 2014. Maloney, Patricia. "Best of 2013 - With Cinder Blocks We Flatten Our Photographs at Romer Young", Daily Serving, December 25, 2013. Cheshire, Tom. "Original(ish) Works of Art", Wired U.K., September 2013, Page 74-75. Laster, Paul. "Christine Messineo at OHWOW", The Aesthete. August 2013. Hotchkiss, Sarah. "Unflattened Photographs at Romer Young", KQED, July 8, 2013. "Landmarks and Monuments at Art in General", DLK Collection, June 14, 2013. Baker, R.C. Letha Wilson: Landmarks and Monuments, Village Voice, June 12, 2013. D'Agostino, Paul. 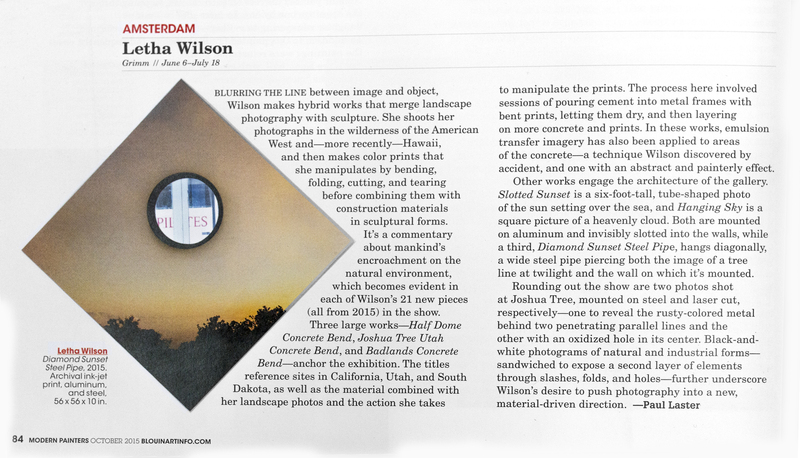 Art Picks from Print, The L Magazine. April 24, 2013. "Land Marks", Co-published by Hassla and Art in General, April 2013. Edition of 500. Doran, Anne. Exhibition Reviews, Letha Wilson, Higher Pictures, Art in America, April 2013, p. 113. Chamberlain, Colby. 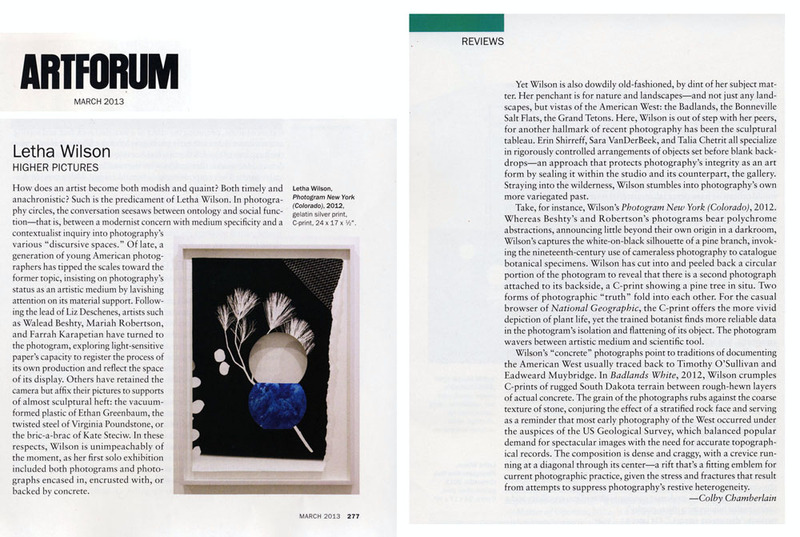 Reviews, Letha Wilson, Higher Pictures, Artforum, March 2013, pp. 277-278. Aletti, Vince. 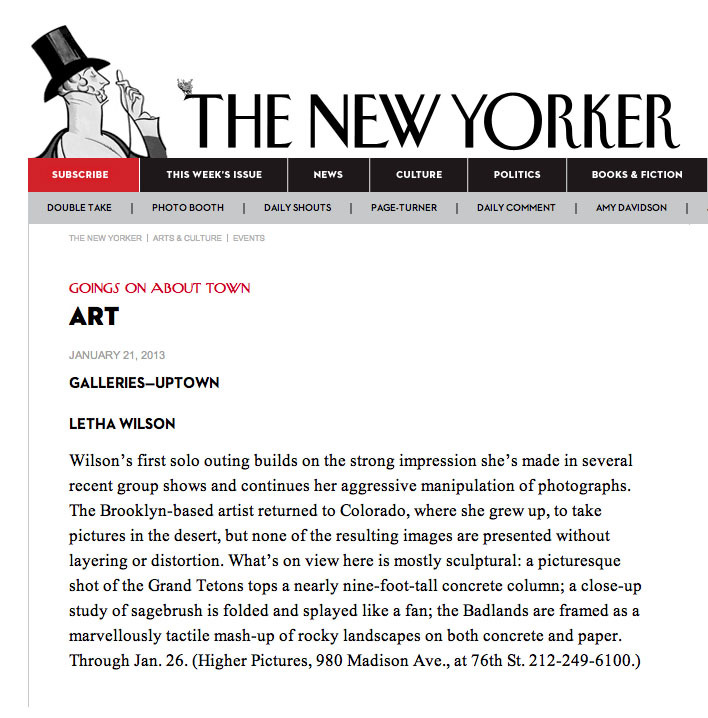 Goings On About Town: Art "Letha Wilson", The New Yorker, January 17, 2013. Clear Cut exhibition catalog, 2013. Essay by Vanessa Nichols. Published by G44 Centre for Contemporary Photography, Toronto, Canada. Shreck, Christopher. "Studio visit with Letha Wilson", All of This is Rocket Science, December 17, 2012. New. New York exhibition catalog, 2012. Essay by Deborah Kuan. Published by Essl Museum Kunst Der Gegenwart. pp 62 - 71. "New. New York at Essl Museum", Sleek Magazine, November 26, 2012. A3 series #3, Edition of 300, Risograph prints, Published by Vandret publications, November 2012, Copenhagen. Rothman, Aaron. "Landscape Photography: New Visions, Part 4", The Design Observer Group, places.designobserver.com. August 21, 2012. Fruit Salad, Bronze Age Editions, Summer 2012. Disturber Magazine, Issue 2, Summer 2012. London, U.K.
Aletti, Vince. 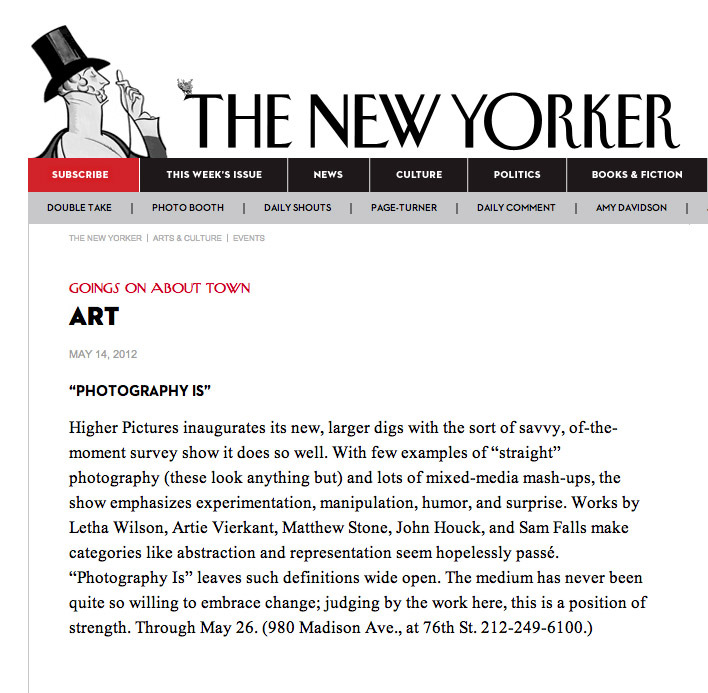 Goings On About Town: Art "Photography Is", The New Yorker, May 10, 2012. "Letha Wilson: Interview by Jason Judd", Bite Magazine, Issue 3. Winter 2012. Pgs. 24-29.
Zimmer, Lori. "2-D Pushers", www.artslant.com (New York), February 14, 2012. "Gold Strike Supper", White Zinfindel, No. 2. TV Dinners, Fall / Winter 2012. Pg 66-69. "Artist Edition Paper Planes", The Believer: The 2011 Art Issue. Magazine supplement, curated by Chris Wiley. November/December 2011. Pages 63 & 64. Ruiz, Steve. "Actual Presence Suggested", www.artslant.com (Chicago), August 29. 2011. Winchester, Tom. "Interviews: An Analog Path for Photgraphy", www.hyperallergic.com. August 12, 2011. Daly, Hannah. "A Fading Feeling", www.artslant.com (New York), August 8, 2011. Miranda, Carolina. "This Week: Must-See Arts in the City", WNYC (wnyc.org). August 4, 2011. Aletti, Vince. 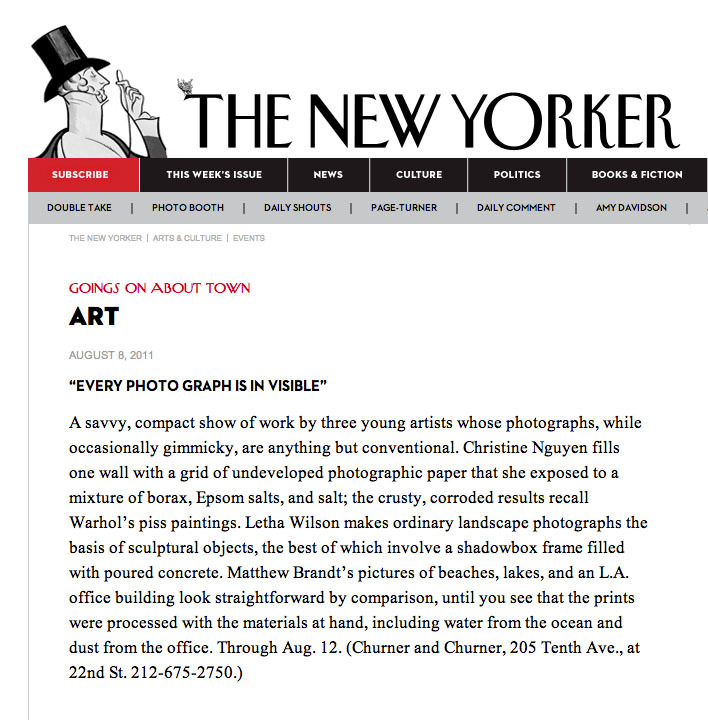 Goings On About Town: Art "Every Photo Graph is In Visible", The New Yorker, July 27, 2011. Doran, Anne. "Art Review: Always the Young Strangers: Young women photographers put a fresh feminist spin on the medium. ", Time Out New York, June 28, 2011. Page 41. Cotter, Holland. "Art in Review: Always the Young Strangers", The New York Times, June 9, 2011. Page C25. Aletti, Vince. 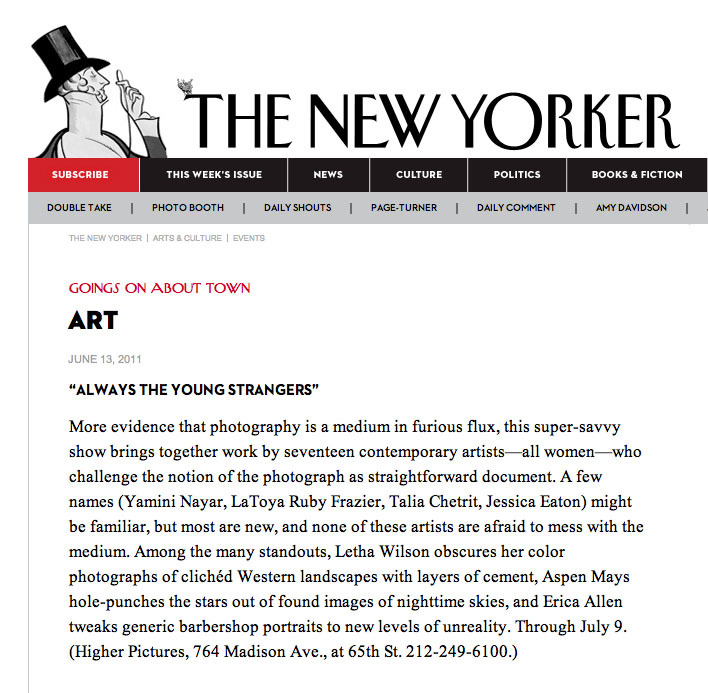 Goings On About Town: Art "Always the Young Strangers", The New Yorker, June 3, 2011. Traux, Stephen. "New Monuments on the Lower East Side" www.hyperallergic.com, May 5, 2011. Gopnick, Blake. "Wall Mugs Tree", The Daily Beast, www.thedailybeast.com. April 15, 2011. Sutton, Benjamin. "Renewed Monuments: Sculpture in the Post/Un-Monumental Era", The L Magazine, April 26, 2011. Broz, Joan. "Morton Arboretum art exhibit celebrates tree forms", The Daily Herald, April 26, 2011. Maine, Stephen. "Variety Trumps Argument at the Bronx River Art Center", www.artcritical.com, April 23, 2011. Russeth, Andrew. "The Working Title at the Bronx River Art Center", www.16miles.com. April 7, 2011. Nordeen, Bradford. "Fanzine Does New York Art Week 2011", thefanzine.com, March 6, 2011. Monnier, Annette. "Letha Wilson 'Punch the Sky' at Vox Populi", onereviewamonth.com, February 27, 2011. Nathan, Emily. "Brooklyn Local", Artnet Magazine, Feb. 12, 2011. So-Young, Moon. "Environmental Art That Does More Than Alter Nature", Korea JoongAng Daily, Feb. 11, 2011. Newhall, Edith. "Artwork using photographs in unconventional ways", The Philadelphia Inquirer, Feb 6, 2011. Vettese, John. "School of Life", Philadelphia Citypaper, January 20-26, 2011. MacMillan, Kyle. "Future of art, through eyes of under-33s", The Denver Post, Dec. 9. 2010. Paglia, Michael. "Two young stars of the art world are on display this month in Denver", Westword, Nov. 30, 2010. Possible Press, Issue 2. A quarterly publication of artists' writings. September 4, 2010. Kate Steciw. "Letha Wilson", The Photography Post, August 16, 2010. Boyce, Peter. "Guest Curator Offers Day Glow at Nudashank", Radar Redux, Baltimore Art and Culture, August 12, 2010. Graves, Jen. "Magical Thinking", The Stranger, Seattle. July 6, 2010. Hackett, Regina. "William Powhida's Sideshow Magic", ARTSJOURNAL weblog, July 2010. "Poul Henningsen Docet", Lighting Academy: Il Portale Della Luce, May 14, 2009. Ryzik, Melena. "At a Clinic, Artists Reflecting On Home", The New York Times, May 11, 2009. Saltz, Jerry. "Waste Not, Want Not" Critic's Pick, New York Magazine online, June 27, 2008. Dan Bischoff. “Artists take measure for its own sake”, The Star-Ledger, January 6, 2008. Benjamin Genocchio. “Art Review; A Chance to Fill Up on Visual Treats”, New York Times, April 25, 2004, p. 9. Middlebrook, Jason. "Top Ten", Artforum, February 2003, p. 55. Powhida, William. "Majority Rules", The Brooklyn Rail, Summer 2002, pp. 8-9.